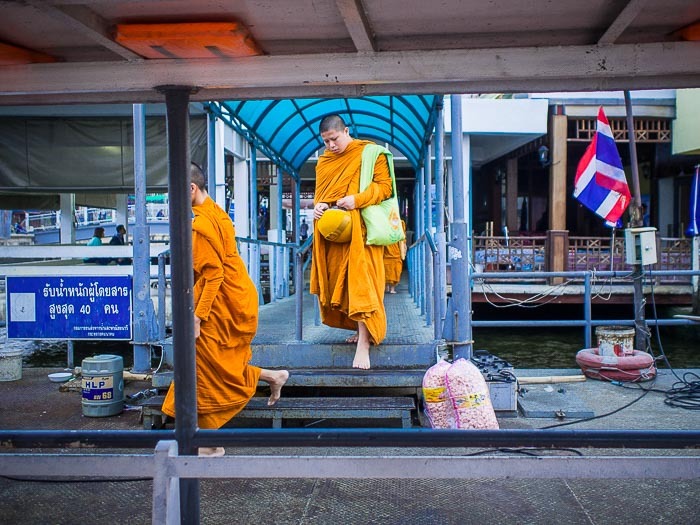 Buddhist monks board a cross river ferry to take them to the Thonburi side of Bangkok. 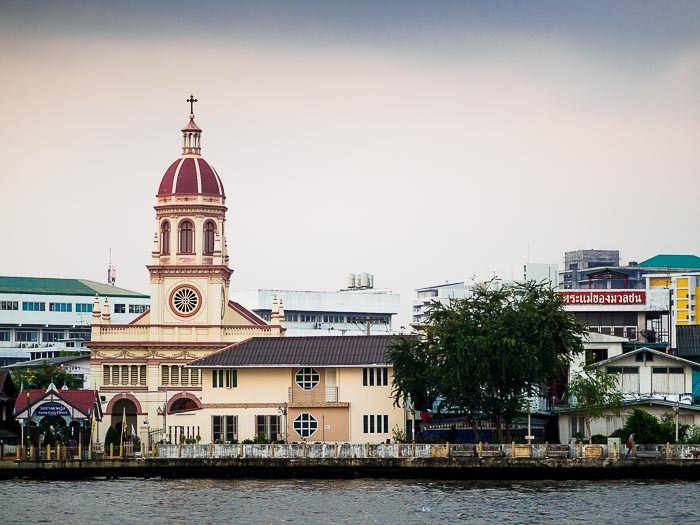 I went to Sunday mass at Santa Cruz, a Catholic church on the Chao Phraya River in Thonburi. It's one of the first Catholic churches in Thailand. It was established in 1770 by Portuguese friars who ministered to Portuguese soldiers and mercenaries allied with King Taksin who was battling the Burmese. The Portuguese married Thai women and a small Catholic community sprung up on the river. Santa Cruz church, across the river from the Flower Market. The church is directly across the river from Pak Khlong Talat, better known as the Flower Market. It's one of the stops on Bangkok's "tourist trail." Within walking distance of Wat Po and the Grand Palace, with a pier for the Chao Phraya Express Boats thousands of tourists a day tramp through the market. Santa Cruz is only a few hundred meters away but it might as well be in another country. Few tourists find their way to the neighborhood. As a result it's a lot more laid back. Even though there's a large Catholic presence in Santa Cruz it feels more Thai than the heavily touristed parts of Bangkok. 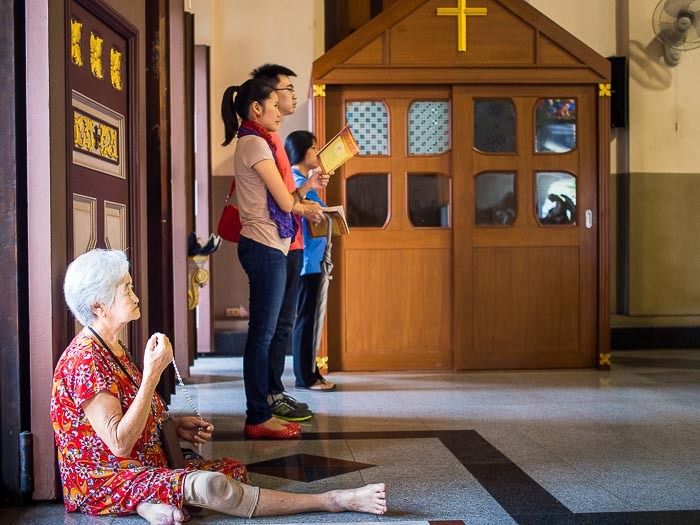 A woman sits on the floor near the doors of the church during Sunday mass. I've been working on a sort of mini project in Santa Cruz for the last few months. I've been over there often enough that residents recognize me and wave or chat. It's a really pleasant part of the city. I've been trying to get into the church since I started going over there but it's only open for mass and I've never been there at the right time. Sunday I went to Santa Cruz specifically to go to mass. Mass in Santa Cruz church. The church was packed. It was so full a few people sat on the portico in front of the church. It's a beautiful building. Some of the churches I've been in Bangkok are built in a pseudo Thai style. Not Santa Cruz. It's Portuguese roots are still visible (the current sanctuary was built in 1916). 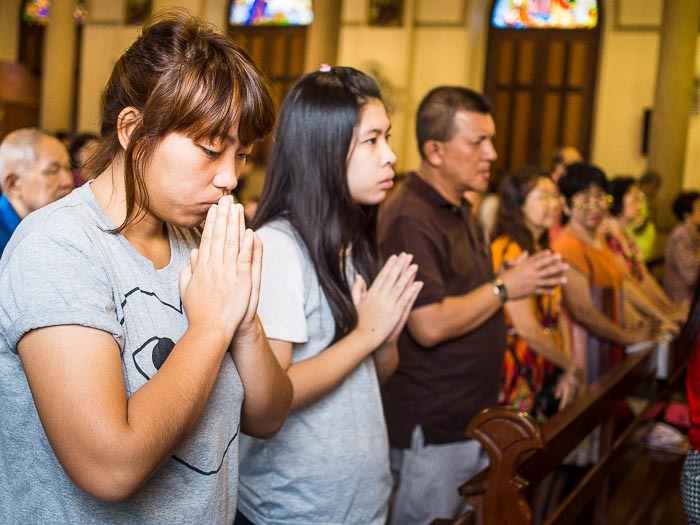 Thailand is overwhelmingly Buddhist, but Thai Buddhism is tolerant of other people and faiths, so Catholics in Thailand are allowed to practice their faith freely. 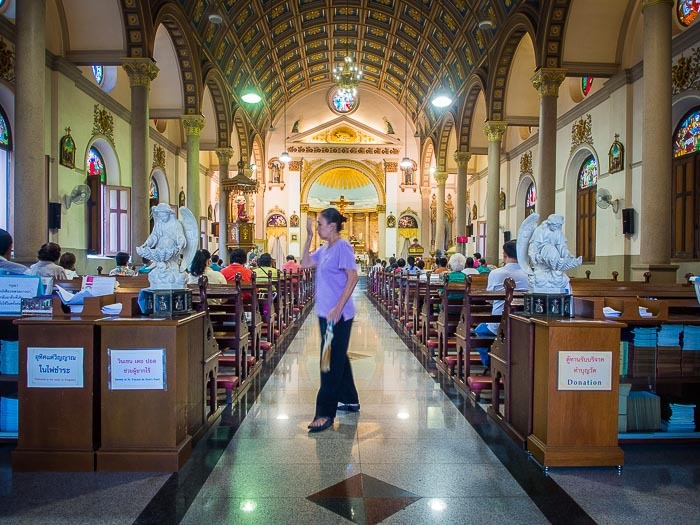 There are only about 300,000 Catholics in Thailand, but the church has a presence that goes beyond its small numbers. There are several Catholic hospitals and universities in Thailand and the Church is involved in numerous charity and community building organizations. A woman and her daughter sit under the portico in front of the church during mass. Bangkok is an amazing city. The neighborhoods, like the one around Santa Cruz, still have a small village feel to them even though it's in the middle of a city of 12 million people. 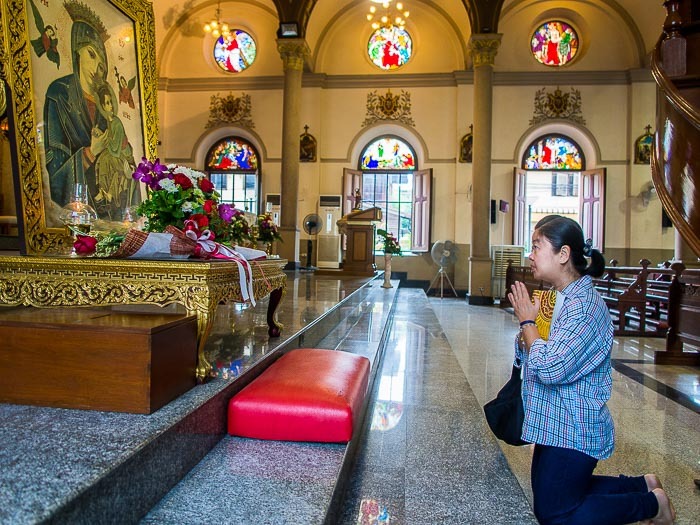 A woman prays at shrine to the Virgin Mary in the church. There are more photos from Sunday in Santa Cruz in my archive or available from ZUMA Press.